After much searching I’ve finally found somewhere you can buy tubs of green tea ice cream for your own freezers!! Commonly found in orient al restaurants, Green tea ice cream is slowly becoming one of my favourite ice cream flavours and today my search came to an end when I entered a japanese supermarket (Atari-Ya) in Temple Fortune/Golders Green and found tubs of my favourite flavour in the deep freeze! 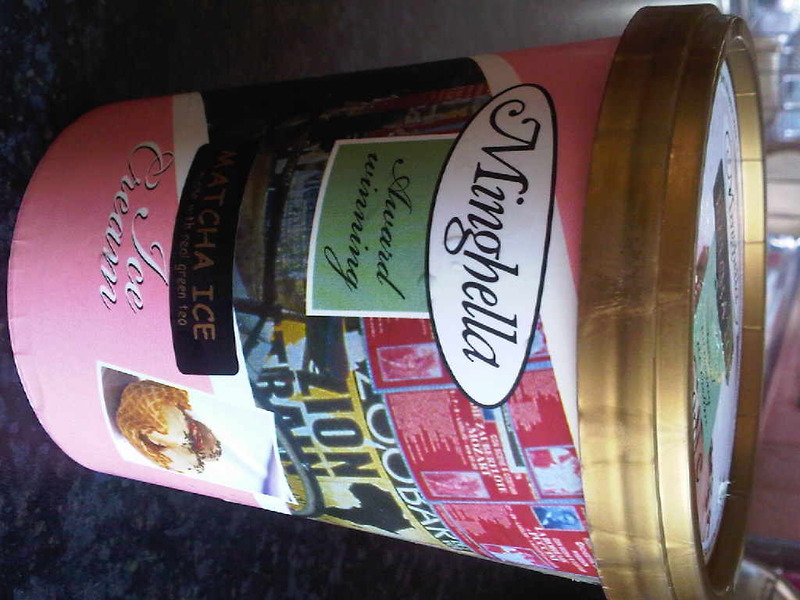 Having searched high and low, at various chinese and korean supermarkets my eyes sparkled when I spotted Minghella Matcha Ice cream. Although my indulgence cost a rather steep (in my opinion) £5.35 for a tub about the size of Ben & Jerry’s, I didn’t hold back given that only yesterday I was prepared to splurge £3 for a scoop and a half of the luscious green stuff from Me Love Sushi in order to satisfy my craving! Although Im ecstatic about my find..there’s only one problem. Now I know I’m able to purchase green tea ice cream so easily, theres nothing to stop me from passing the shop whilst driving around london (accidentally of course) and stopping by to get my fix! I just hope it doesn’t take away from the overall obsession. After all..you know what they say…too much of a good thing isn’t always so good!! ← Summer’s over..or is it..